Macrophage cell engulfing bacteria. 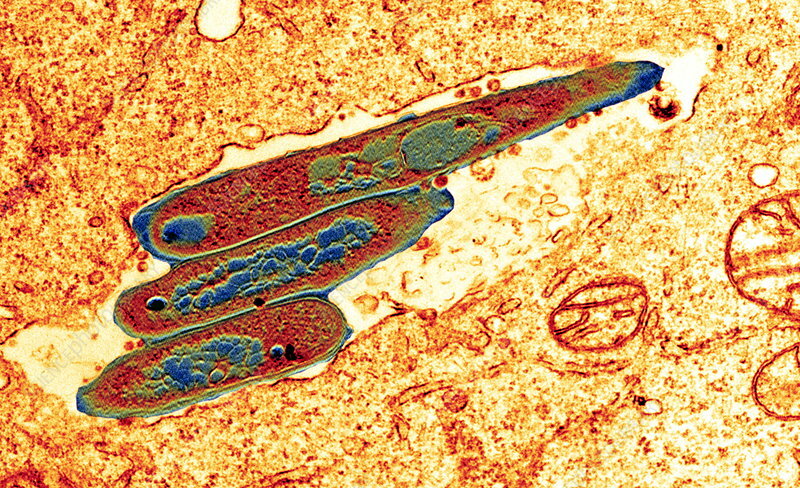 Coloured transmission electron micrograph (TEM) of bacteria (centre, rod-shaped) inside a macrophage cell. The macrophage cell (a type of white blood cell) has engulfed the bacteria in a process that is called phagocytosis. The bacteria are contained in a structure called a vacuole (pale yellow), which is distinct from the surrounding cell cytoplasm (orange). The bacteria will be digested by enzymes from cellular storage structures called lysosomes (not seen). The bacteria are tuberculosis bacteria (Mycobacterium tuberculosis), most often found infecting the lungs.